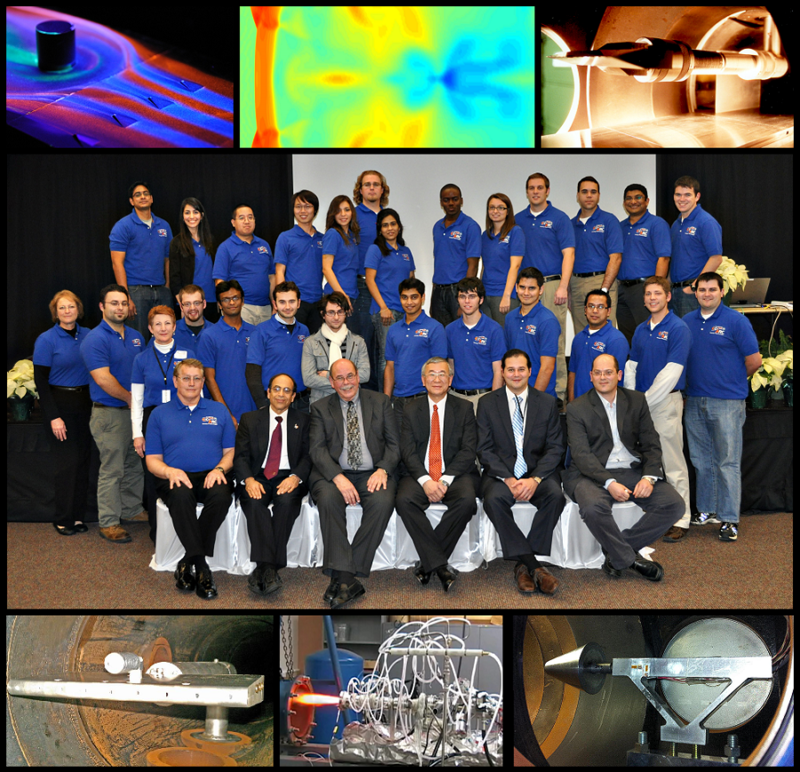 Welcome to the UT Arlington Aerodynamics Research Center webpage. The Aerodynamics Research Center has existed at the university in one form or another since the 1930s when it was originally an aircraft maintenance and fabrication facility. The present ARC was built in 1986, allowing for a large expansion of equipment which now includes low-speed, transonic, supersonic, arc jet, and hypersonic tunnels. Current research has focused on experimental high-speed and high-temperature aerodynamics, shock/boundary layer interaction, and detonation. In addition to the experimental facilities, we have extensive capabilities to study and test aerodynamic models using computational fluid dynamics. The experimental test results can be used to validate the CFD models, and vice-versa. Our clients and sponsors include both corporate and government organizations. Congratulations to Cody Ground on his selection as a permanent employee at NASA Langley's Hypersonic Airbreathing Propulsion branch, 2017. Congratulations to Dr. Fabrizio Virgine on his selection as an Assistant Professor at San Jose State University. Congratulations to Cody Ground, the Winner of NASA Pathways in Hypersonic Airbreathing Propulsion, 2017. Congratulations, Professor Luca Maddalena for winning a $1.01 million grant from the highly competitive Defense University Research Instrumentation Program. The official UTA announcement can be found in http://www.uta.edu/news/releases/2015/10/Maddalena-DURIP.php and the official Defense Department can be found in http://www.defense.gov/News/News-Releases/News-Release-View/Article/605547. Professor Maddalena’s award is supplemented by $210,000 from the university. This DURIP award will vastly increase the RDT&E capabilities of the arc heater to improve the understanding of the complex flows of hypersonic vehicles, in the realm of aerothermodynamics. This grant is unique for its size and also in being jointly funded by ONR and DARPA. It is worth noting that much preparatory work was done by Professor Maddalena and his team. Professor Luca Maddalena is elected as an Associate Fellow of AIAA for the Class of 2016: http://www.aiaa.org/2016AssociateFellows/. We congratulate Professor Maddalena for the recognition by the aerospace community on his contributions. The grade of Associate Fellow of AIAA is an exclusive recognition as only 1 out of 150 voting members can be upgraded annually, subject to stringent requirements. Congratulations go to Katherine Yarbrough who is serving as an intern at NASA Johnson Space Center in Fall 2015. Professor Frank Lu attended the 30th International Symposium on Shock Waves in July 2015 that was held in Tel Aviv, Israel. He presented two papers as well as attended the International Advisory Committee meeting. Professor Luca Maddalena attended the Hypersonic Technologies and Aerospace Planes (HyTASP) Conference in July 2015 in Glasgow, UK. In addition to presenting two papers, he was instrumental in the conference organization as the HyTASP Program Committee Executive Secretary and Vice Chair. The ARC had a strong presence at AVIATION 2015 that was held in Dallas in June 2015. In addition to three paper presentations, the ARC shared a booth with the AIAA North Texas Section. Ezgihan Baydar was an intern at the NASA Glenn Research Center for the second summer as part of her Harriett G. Jenkins Fellowship award. In late May and early June, Professor Frank Lu traveled to China. He delivered a plenary lecture at the 7th International Fluid Dynamics Conference in Qingdao, China; a guest lecture at the Forum on Fluid Dynamics of Complex Flows in Hangzhou, China; and a number of seminars to the State Key Laboratory for Aerodynamics in Mianyang, China. Congratulations to Nandakumar Vijayakumar on his selection as a new member of the AIAA High Speed Air Breathing Propulsion Technical Committee. Congratulations to Sarah Hussein on being awarded the prestigious National Science Foundation Graduate Research Fellowship Program Fellowship. Congratulations to Stefano Gulli on being awarded the highly selective and prestigious Spring 2014 Dissertation Fellowship from the Office of Graduate Studies. Professors Maddalena and Massa have been awarded, from a field of highly qualified competitors, by NASA Aeronautics Research Mission Directorate (ARMD) under NRA NNH10ZEA001N-HYP1 - Hypersonic Project. The UTA’s group will collaborate with NASA on the Hypersonic Project for fundamental air-breathing hypersonic technologies with specific focus on Hypervelocity (Mach 8+) Propulsion. From the NASA Fundamental Aeronautics Program -- Hypersonics Project website: “The Hypersonics Project focuses on the development and validation of foundational tools and technologies for two hypersonic applications: Reusable Airbreathing Launch Vehicles (RALV) and Planetary Atmospheric Entry Systems (PAES), focused on delivering large scientific payloads with or without humans to and from the surface of Mars.” This sole award attests to the reputation of Professors Maddalena and Massa, as well as to confidence that NASA has on us here at the ARC on our expertise, facilities and commitment to continued excellence in hypersonics. You can see the press release here.